You’ll find everything from distinctive furniture to unusual collectibles on sale at the Uptown Downtown store on W. Liberty street in Wooster, Ohio. 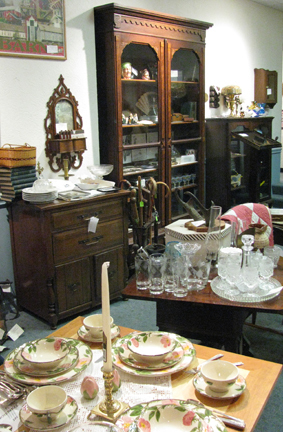 Please consider shopping at the Uptown Downtown Antiques store located at 215 W. Liberty St. in downtown Wooster, Ohio. They have graciously dedicated and area of space for items that generate funds that benefit the Wayne County Historical Society when sold. They are not charging the Society for this space and we can’t thank them enough for their support! Downsizing or know someone who is downsizing? Please consider donating your fine antiques to the Wayne County Historical Society to sell. We can provide you with an appraisal of your donation for income tax deduction purposes. We can also arrange pick up of larger items. The store is a great place to purchase a gift for that person who has everything.